An enchanted evening at the opening reception of Rebar, a solo show of Erik ReeL paintings, Friday 7 November 2014, Museum of Ventura County Tool Room Gallery, [a Coastal California Art Exhibition event]. My work has been influenced by micro- and nano-photography, poorly erased whiteboards, sidewalks, ruins, abandoned industrial sites, ancient stone surfaces, fire, sand, sea, ice, charcoal, hieroglyphs, esoteric texts, Hubble Deep Field photographs, photographs of things we cannot see with the naked eye in real time, foundries, wars, concrete…. As for early influences in the visual arts, growing up in Seattle my visual starting point for painting was Mark Tobey’s late work: the White Writing paintings. Other influences included Pacific Northwest Scandinavian textile design, architectural, and design traditions, which tend to be highly abstract. 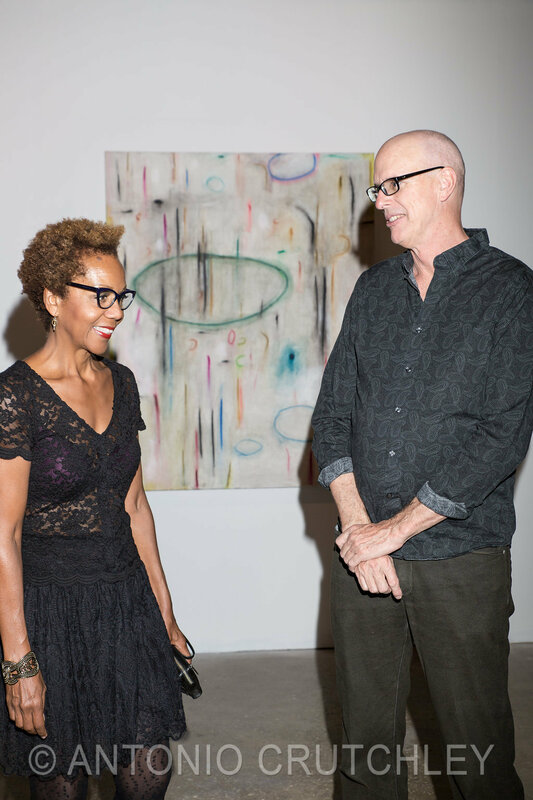 To celebrate the artist and his recent body of work, the gathering included collectors, curators, the artist community, media, friends, and the EDGE network. The vibe: high energy; appreciation of extraordinary improvisational work; attendees were dressed to express; and the rich camaraderie and conversation. To the EDGE network and viewers, inspiration happens all around us. Be inspired, push the boundaries, and stay true to your vision and creation. Posted in EDGE Cosmo and tagged Art + Fashion, EDGE at Art Exhibition, erik reel, featured, Museum of Ventura County, Rebar Art Exhibition. Bookmark the permalink.